The location of the Castle Garden Bridge was selected to complete the public highway from Driftwood to Karthaus. The Castle Garden Bridge crosses the Bennet’s Branch of the Sinnemahoning River in Cameron County, Pennsylvania. It is located just off Route 555 and accesses the mountainside where famous movie cowboy Tom Mix was born. Named for a nearby village, the location of the Castle Garden Bridge was selected to complete the public highway from Driftwood to Karthaus. 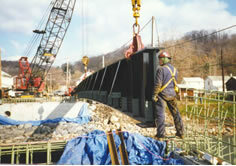 P. Joseph Lehman, Inc., Consulting Engineers designed the H-span pre-stressed reinforced concrete I-beam bridge with reinforced deck to replace an earlier bridge built in 1875 and 1888 in the same area.